Read the many ways Russell & Lazarus has successfully resolved their clients’ accident claims. While these results are never guaranteed for other cases, these case results will show you the importance of hiring an experienced law firm that handles only personal injury claims. Motorcycle riders are some of the most vulnerable on the road. A rider is almost completely exposed to the hazards on the road. As a result, when another driver makes a mistake, the results can be catastrophic. In these cases, a rider may want to work with an Orange County motorcycle accident attorney. If you would like an idea of how your specific California injury claim could end up with a positive result, contact the attorneys at Russell & Lazarus today at (800) 268-9228 for a complimentary case evaluation. A 53-year-old Motorcycle rider was cut off by a driver on the freeway causing him to fall and shatter his ankle. A 40-year-old motorcycle rider was cut off by a vehicle making an unsafe lane change causing a knee injury. The defendant’s insurance company played games, and as a result, ended up paying three times the policy limits or $300,000. A 44-year-old steel worker riding his motorcycle fractured his ankle when he broadsided a car negligently coming out of a driveway. While many motorcyclists are devoted to riding and will attest that there is no experience quite like it, they are especially prone to serious injury when struck by other motorists. This is due in part, of course, to the fact that there is virtually nothing between the striking vehicle and the rider to protect him. However, another significant contributing factor is that other motorists simply don’t often even see the rider, so when they collide they have done nothing to slow down or avoid the accident. The result can mean long-term or lifelong injury, or even death. Following an accident, the injured rider will find that insurance carriers may have different rules and procedures for motorcycle riders. This makes it especially important to work with an experienced Orange County motorcycle accident lawyer to advocate for your rights and get the damages you are entitled to. Carelessness. To prove negligence, an Orange County motorcycle accident lawyer can explain that you typically must prove that another party was careless or negligent on the road. Causation. In addition, the negligent acts of other party must have caused your injuries. An Orange County motorcycle accident lawyer can tell you that this can be difficult to prove as there are usually many different variables that may contribute to an accident. Injuries. Finally, the negligent act must usually lead to some injury or harm. 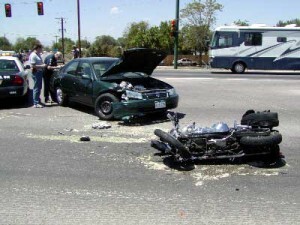 If you have a question about a motorcycle accident, you should contact an Orange County motorcycle accident lawyer. Motorcycle accidents are very fact-specific and you will want an experienced attorney to analyze your case. If you would like an idea of how your specific California injury claim could end up with a positive result, contact an Orange County motorcycle accident lawyer at Russell & Lazarus today at (800) 268-9228 for a complimentary case evaluation.